Spring in the Blue Mountains! Spring - the garden is bursting with life, with beautiful orchids and blossoms just finishing their show - and the red bottle brush and sweet peas flowering spectacularly. Inspiring little herbs, lemons and blossoming fruit trees have had us busy in the kitchens making new and delicious produce to share with you at the markets and in stores. Parissi Pasta Sauce ~ Spring is out now, our new fruit and nut full Gluten Free Raw Muesli has also arrived, and if you were lucky enough to attend the Red Tent Dreaming event in October you would have had the opportunity to try our Lemon and Vanilla Bean Brulee Tarts. We sit out on the front verandah in the mornings with our coffee and our kitty cats, talking to our resident pair of magpies. Asher is working on a body of line drawings, so while I potter about the front garden checking the progress of the apricots and cumquats, he captures beautiful gestures and movements with his charcoal and pencil. I recently booked my tickets back to Tasmania for summer - we will be attending the MoMa markets from December to March, and also running our family’s Blueberry Farm again, so a busy and beautiful season coming up. 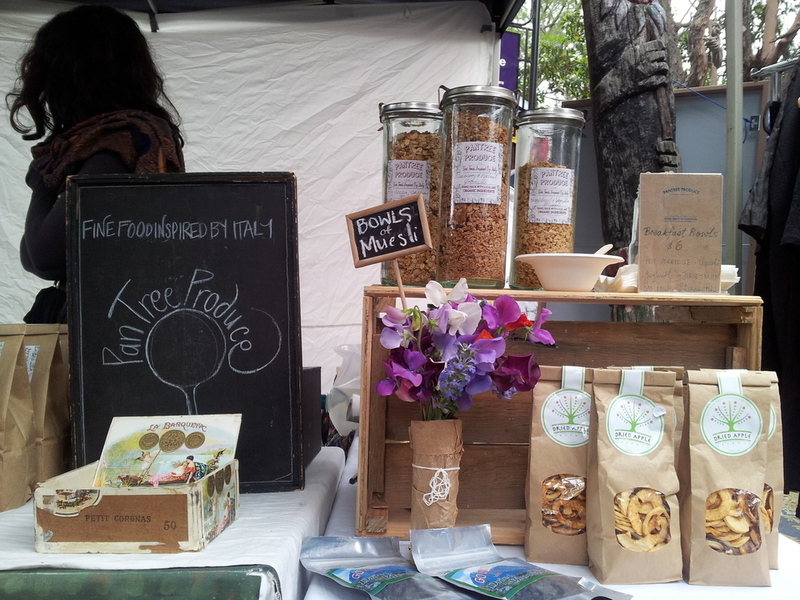 Nina, my sister, will be continuing an offshoot of PanTree Produce at Marrickville’s Addison Road Organic Food Market over the summer. We are calling it “PanTree Produce presents: The Muesli Bar”, and we will be focusing on our delicious range of muesli and granolli to eat at the markets and to take home too. With summer just around the corner, you will have to keep your eyes on our blog and ‘LIKE’ us on FaceBook to keep up with all of the season’s exciting action! Tasmanians watch out - exciting new baked goodies coming your way, as well as the blueberry season and a preserving party with my friend that will be a dream come true.